At the request of my clients I have created a Ganesh's Road Opening Soap to compliment my bath oil and conjure oil! This soap clears away impossible obstacle and tasks quickly and also focuses psychic abilities and aids spiritual matters. This oil is PERFECT if you have someone in your life always demanding that the focus be on them with their dramatic situations. Let this clear the drama from your life so you can focus on the success you deserve! Use this soap to invoke Ganesh or use on a orange, white, green, or yellow candle. Chant Ganesh's mantra "Om Sri Ganesha yai Namah". Traditionally this is chanted 108 times. This mantra was chanted and Ganesh invoked with the preparation of this oil to bring you the best results! Add it to your liquid hand soap or liquid body wash to reinforce your obstacle clearing in everything you touch! 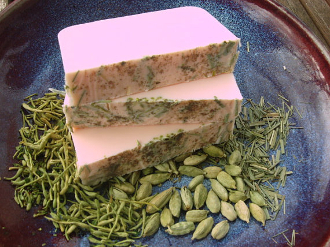 Created with honeysuckle, gardenia, cardamom, lemongrass, and bergamot essential oils and herbs.